Great Investment! 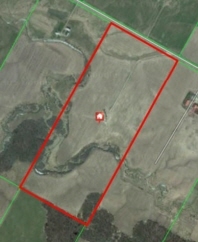 101.23 acres Bare Land with 78.5 workable and possibility of clearing more acreage. Some tiling. Turbine income for 2015 was $8,012.77 (based on revenues generated each year). They are in the 8th year of a 21 year lease with a renewal likely at another 20 years. The farm is currently rented at $200.00 per acre.